As an Association for Employees, we strive to be efficient and that our function is sustainable. 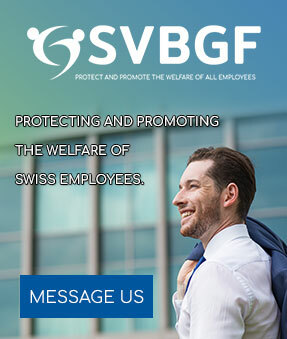 Any employee, working for any company in Switzerland, can become a member. There are no pre-set obligations or restrictions in becoming a member. We offer a wide range of services to choose from and it is offered at an unrivalled members’ fee. Working to Ensure a Good Work Environment: We take part in corporate opinion-forming in order to be able to ensure the well-being of all employees. We work constructively towards making sure that all our members receive good provision and feel good about their work environment. Voice and Advocate Employee Concerns, Interests and Problems: We make sure that problems, concerns and interests are made clear to Employers, and we will work toward finding solutions to these, working together with Employees and Employers. Free Legal Advice and Protection: If a member should be in need of legal advice or representation we will provide this service for free. We work within the labour and social law to find the best ways to solve this kind of legal queries. Legal Insurance: We offer insurance for traffic and private liability for a minimal fee payable per year. This will cover any type of legal insurance claim that might occur during that year. Special Rates for House, Car and Private Insurance: We do offer special rates on all Insurance for your Car, Private, House and House contents, with almost all major Insurance Companies. Health-care Helpline and Supplementary Health Insurance: Together with your Health Insurance, we offer supplementary reimbursements for various health conditions that take the form of an extra payment towards a medical bill. We also offer a free Health-care Helpline that can give advice and direct you to the best facilities for your health needs. Retirement fees: You can stay on as a member and receive all benefits but at a third of the regular membership fee. These are the standard services we offer to employees; however, there are many more services that you can benefit from. For more information contact us by e-mail or give us a call. The Swiss Automotive Industry Is Not Known For Producing Complete Cars; They Supply Vehicle Parts, Accessories, And More.